On a wet and cold night at National Football Stadium, the PNG Hunters put on a clinical display and remain undefeated at home this year after defeating Northern Pride 22-6. 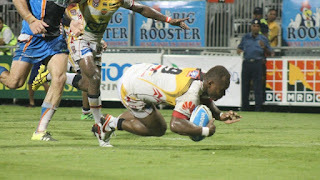 Star halfback Ase Boas put in a man of the match performance to help his side get back on track with the win following two losses on the road. However, the visitors were first to score after forward Sheldon Powe-Hobbs crashed over the line to score. Khan Ahwang converted the try with just 10 minutes into the game to get the Pride a 6-0 lead. It was a penalty by the Pride that gave the Hunters the perfect opportunity to hit back and they did so, with team enforcer and co-captain Adam Korave bursting through the defence to score beside the uprights. His fellow skipper Noel Zeming converted the try to draw scores level. Both sides were guilty of loose balls and giving away lazy penalties as the arm wrestle continued into the half-time break with both sides locked at 6-6. The Hunters forward pack, led by the consistent Brandy Peter and Essau Siune, set the platform for their backline as Boas found Philemon Kimisive on the wing with a long cut out ball after an error from the Pride. Zeming wasted no time to convert the try from the sidelines, giving his side a six-point lead eight minutes into the second half. The Hunters went back-to-back thanks to some good lead up work from stand-in fullback Bland Abavu to set big centre Thompson Teteh in to score. The Northern Pride forwards kept on charging with fulltime on the horizon, but the Hunters remained solid. Desperation led to errors and penalties which gave the Hunters enough opportunity to put the icing on the cake as the classy rake Wartovo Puara scored from a dummy run just 15m in from the Pride try line. Despite Zeming missing the conversion, the Hunters were still in control and won the encounter 22-6. PNG HUNTERS 22 (Adam Korave, Philimon Kimisive, Thompson Teteh, Wartovo Puara tries; Noel Zeming 3 goals) def NORTHERN PRIDE 6 (Sheldon Powe-Hobbs try; Khan Ahwang goal) at National Football Stadium, Port Moresby.